A walk into the exhibition hall of the Fairway Hotel, where a group art exhibition is taking place, makes you feel like you are visiting a crafts bazaar. The paintings sit awkwardly on dinner chairs leaning against the back. Some paintings hang grotesquely on the wall; almost hidden by the poor lighting in the hall. 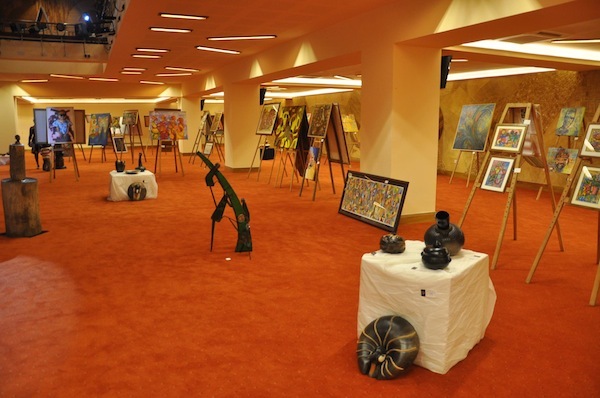 From the art exhibition “Aftermath of Ugandan Art after 50 years” at Fairway Hotel, Kampala, December 2012. A quick conclusion here is that little thought was put in the presentation of the art works; not to mention the evident poor execution of many paintings on display. The exhibition itself summarily lacks the colorful enthusiasm and elegance that would be expected in a group exhibition in such an upscale venue. Despite this obtuse display, there are a few art pieces which deserve a nod: Wasswa Katongole and Lukandwa Dominic’s batiks; Yusuf Ngula’s naïve collages dotted with academic notations; Lukwago Saad’s colorful animations; these will all rouse some excitement for many art lovers. But this kind of exhibition unfortunately does not exist in isolation. There are many such exhibitions featuring on the local art scene here and there. Though some may not be as frivolous as the above-mentioned, they all seem to follow a particular trend where artists from a particular studio gather and stage a group exhibition with intent of “working together”. 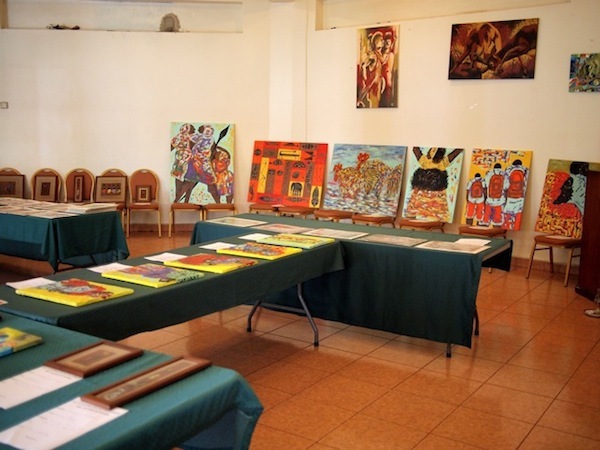 The exhibition “The aftermath of Ugandan art after 50 years” taking place at the Fairway Hotel seemed to have been dominated by artists from Njovu Art Studio. MishMash in Kololo has been a brainchild of many such exhibitions. Every month this establishment has a group of artists teaming together to put on a show. Sometimes the artists originates from a particular studio; on other occasions, the management and artists will come up with a theme and work round that. In all this, MishMash is trying to help the artist to be creative and innovative, but also to be relevant to the tastes and preferences of the clientele. This is a worthy idea, especially since it is being guided by a curator (MishMash hitherto has acquired a curator to polish up what they put on display for all of us art lovers). 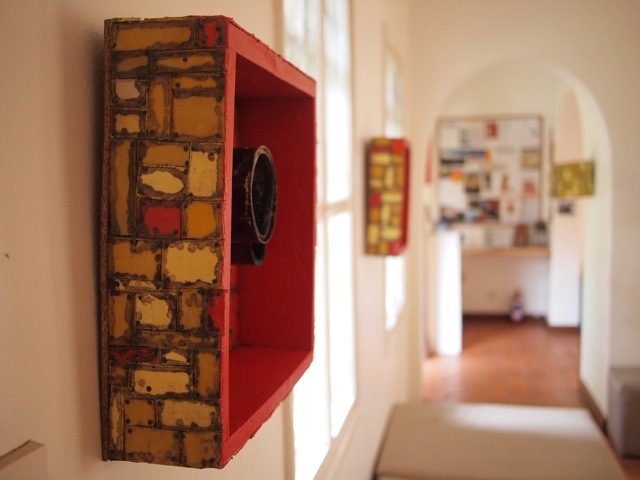 From the MishMash Gallery, Kampala, 2012. Artwork by Collin Sekajugo. Nevertheless, one should question the frequency of these group exhibitions. If MishMash has a group exhibition every month, does this provide adequate time for the artist to think and create? According to visual artist Collin Sekajugo, the idea of group exhibitions is a brilliant idea since it encourages competence and innovation. “The good artist will always try to stand out in a group exhibition,” he says. Competence and innovations are very good products for the real development of art. However, they could be compromised on when a group exhibition is held in commercial establishment like a hotel. Such non-traditional art spaces are often looking for ways to promote their spaces and may have little priority to encourage competence and innovation among the artists. Nevertheless, corporate companies like Fireworks Advertising Agency are eager to promote artists and their works. Their annual art exhibition hinges on a mission of linking artists to business people who have the financial muscle to purchase local art. From the Fireworks Annual Art Exhibition at Kabira Country Club, Kampala, December 2012. Photo by courtesy of Fireworks Advertising Agency. Fireworks has now succeeded on some levels since a bulk of the work put on display in their exhibitions has been bought by business men and local art collectors. The agency should also be lauded for their careful presentation of work as they have worked with recognized art organizations like KART and Uganda Visual Artists and Designers Association. Despite this euphoria, questions abound how artists and organizers balance the issue of quality and price during such collaborative exhibitions. There has been an outcry from the traditional art spaces that the price vis-à-vis quality of art at these corporately organized group exhibitions sometimes is below what is expected. For example, at the Fairway hotel exhibition an art piece by Yusuf Ngula that could fetch a couple of hundred dollars at either Afriart gallery or AKA gallery , was priced at 200 dollars. Conversely, Umoja Art gallery group exhibition “Living Masters 2” features miniatures from artists like Kigozi, Mugalu, Kyeyune, Godfrey and Jude Kateete. Each of these miniatures which measure 18 by 18 centimetres goes for $100. However, some critics argue that the price of $100 is dismal for these pieces given the quality of the work and the type of artist exhibiting. 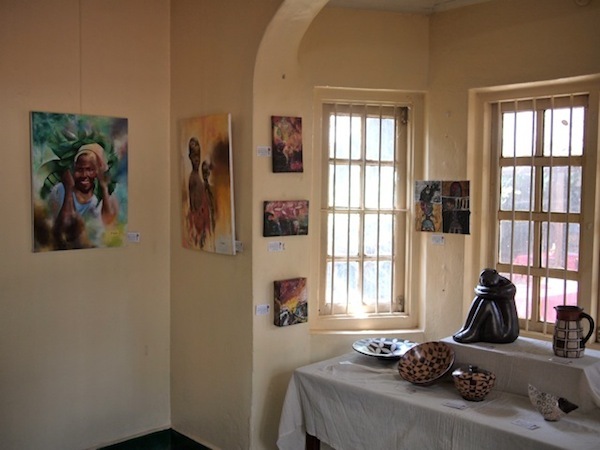 From the art exhibition “Living Masters II (Miniatures” at the Umoja Art Gallery, Kampala, December 2012. The crux of the matter here is that many such exhibitions have an underlying commercial motive and not to foster creativity, competence and innovation among artists. Because of such motive, it comes as no surprise when each of these art exhibitions is tagged with a charity project. An undisclosed percentage of each piece sold is given to a certain charity home; to save orphans or support AIDS victims and much more. The Mishmash gallery, Signature Art exhibition, Fireworks Annual Art Exhibtion have in the recent past been victims to this trend. More so, smart artists and organizers have come to discover that group exhibitions sell more than one-man shows. This, however, depends on the targeted audience, quality of work on display and the level of publicity. “It’s a dilemma for the artist and the organizers given the complex situation of today’s troubled economy,” says Sekajugo. Indeed, it is a complex situation. Artists need to survive in an industry that has a handful of clientele—generally tourists and expatriates—not to mention the brutal reality of today’s troubled economy. 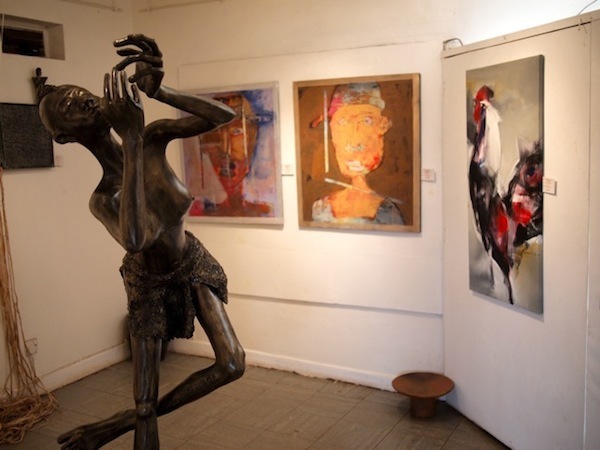 From the art exhibition “10 years of art excellence” at Afriart Gallery, Kampala, December 2012. Nevertheless, artists and art organizers need to create a clear-cut program on how they operate and what is their agenda when they hold such exhibitions. As I pen this article, there is a group exhibition taking place in every art space in Kampala. This crash in program symbolizes the lack of good organization in the local art scene whereby you find the same names of artists exhibiting in two or more art spaces at the same time. 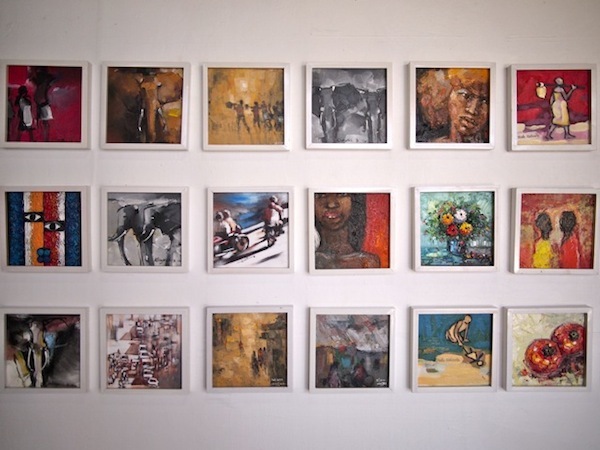 From the art exhibition “December Paintings” at AKA Gallery, Kampala, December 2012. Contrary to the above, the mishmash element (excuse the pun) which characterizes many such exhibitions is not healthy for the growth of the industry. Group exhibitions should be organized with a defined agenda. Is it about charity; is it to foster creativity, competence and innovation, or is it essentially to make money. This kind of organization will help to professionalize the industry and also help artists be more focused as they prepare for such collaborative exercises. In the quest for such tangible professional ethics, art spaces and art organizers need to partner with credible art institutions like 32° East, which can help in the mentoring of good curatorship, documentation and nurturing of artists. 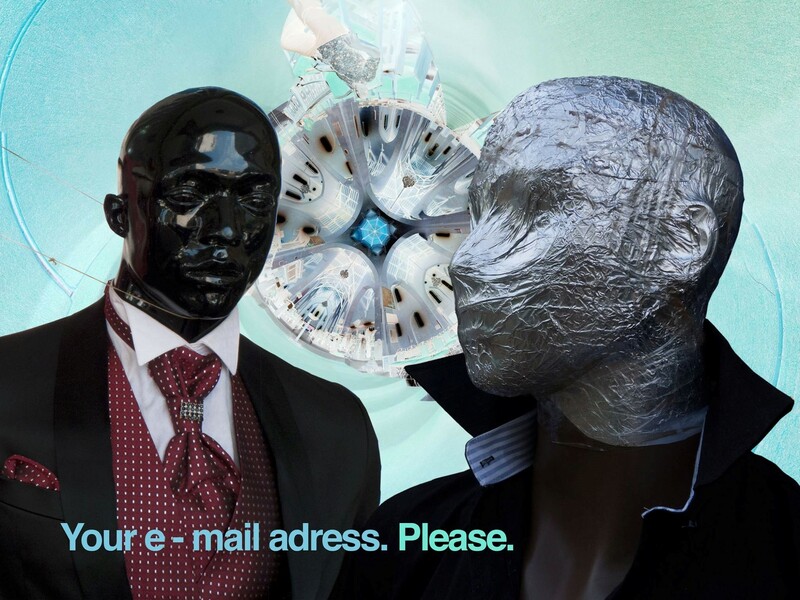 Though such partnership can be interpreted as expensive in terms of finance and time, their overall outcome will not only benefit the art spaces in terms of improving the quality of work put up in their respective spaces, but it will also expose the artist to a more mature approach to their craft. Hence, we will be saved from the gross presentation of art at many such collaborative exhibitions. What are your thoughts on the law of supply and demand in relation to the Ugandan art scene. Would it be more convenient for artists to make much fewer art works, have much fewer exhibitions, be less visible, then raise their prices. The ability to control supply at all costs is something lacking in many African businesses, not just art. As a comparison, I just watched the film, El Bulli: Cooking in Progress. The rest of the year restaurant closed for creativity & new ideas. What artist need to do, is borrow a leaf from artists like Sekajugo and Ronnex. Both these artist have enterprises that are closely linked to their art. Here they can survive as they churn out good art. Aside this, they will continue to feel that they need to survive on a day to day basis hence create lukewarm art. Furthermore, Group exhibitions need to be narrowed down to a particular theme. It should not be for the sake of grouping together and sale. It should be more than that. He is a pioneer in the industry. The Attolini of East African Art’. I find his Responsible Environmental theme spot on and in sync with the expectations of today’s global citizen. Yeah Dominic, impressed by your observations about Ugandan Art.But Artists have always ignored the idea of Art Presentation in the various Art spaces, most of them emphasize more on the quality of the Art works. THEMES, these should always be portrayed in the different Art works displayed….those some Artists tend to be off track. WHAT ARTISTS DISCUSS ABOUT; What determines the PRICING of an Art work??? How can Artists survive despite the troubled Ug. economy??? ?